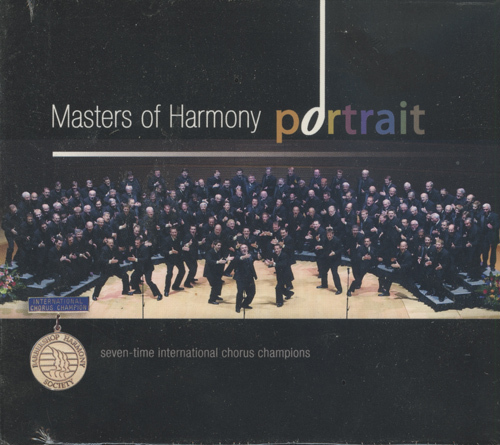 "Portrait" is a strong new collection from the dynamic, 7-time BHS International Chorus champions Masters of Harmony. 15 finely-crafted tunes including some of our favorites "Go Down Moses, "I Will Go Sailing No More," "Good Luck Charm" and "Sold" (sung with 2008 BHS Quartet champs OC Times), "Stand By Me," "Nice 'N Easy" (sung with 2008 Far Western District Quartet champs Masterpiece, "Yona From Arizona," "Sometimes I Feel Like a Motherless Child" and "Portrait of My Love Medley." The Masters, directed by Michigan Jake member Mark Hale, has a wonderful, complex sound that adds new dimensions to these classic songs. Enjoy one of Barbershop's great champion choruses's.